President Trump's legal team knows that his May 2017 interview with NBC's Lester Holt makes him more vulnerable to claims that he obstructed justice. So they have come up with a curious explanation: The interview was "edited" and that's why people are confused about what Trump meant. Trump attorney Jay Sekulow advanced this argument on "Cuomo Prime Time" on Wednesday night. Trump himself brought it up on Twitter a few weeks ago. "When Lester Holt got caught fudging my tape on Russia, they were hurt badly!" Trump said in an anti-NBC tweet in late August. This might be an appealing explanation to Trump's base, since it casts the media -- NBC in this case -- as the villain. But there is no sign that NBC "fudged" the tape of the interview or did anything else untoward. This seems to be part of a pattern of Trump trying to deny what everyone heard for themselves on tape. But Sekulow is making a more nuanced point: That one part of the Trump-Holt interview drowned out another part of the interview. Sekulow is trying to point people to a quote that he believes is exculpatory. Notably, Sekulow revealed to Cuomo that Trump's legal team has repeatedly addressed this matter with Robert Mueller's special counsel office. This is another sign that the Mueller is looking seriously at obstruction of justice issues. "In our professional discussions with the office of special counsel, we have addressed that on multiple occasions appropriately," Sekulow said. Holt lucked into one of the most important presidential interviews in years. NBC announced in May that Holt will sit down for an exclusive interview with Trump. The next day, Trump fired FBI director James Comey. There was immediate speculation that Trump was trying to stop the investigations into the Russian effort to support his campaign. Trump's critics accused him of engaging in a cover-up. The Holt interview took place as scheduled on that Thursday. Holt, the anchor of the "NBC Nightly News," repeatedly tried to get to the bottom of why Trump fired Comey. 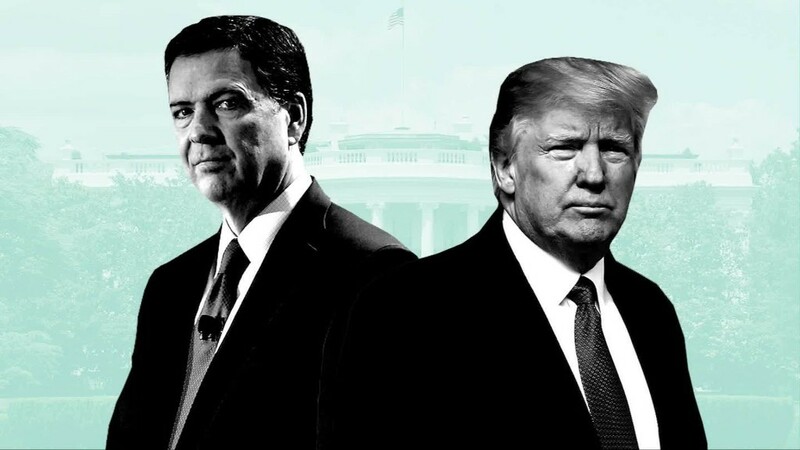 Trump blew up the White House's stated reason, which was that deputy attorney general Rod Rosenstein had officially recommended Comey's firing, and Trump had just accepted the recommendation. Trump said to Holt, "He made a recommendation, but regardless of recommendation, I was going to fire Comey, knowing there was no good time to do it. And in fact when I decided to just do it, I said to myself, I said, you know, this Russia thing with Trump and Russia is a made-up story. It's an excuse by the Democrats for having lost an election that they should have won." Trump made this statement without any interruptions by Holt or editing by NBC. The camera stayed on Trump the entire time. Holt later followed up with questions about Trump's mindset, like "Are you angry with Mr. Comey because of his Russia investigation?" Trump responded, "I just want somebody that's competent." Trump kept talking and talking. But most news reports from other outlets that covered the interview focused on the first statement -- where Trump confirmed that the FBI's Russia probe was on his mind when he fired Comey. This clip with this quote has aired thousands of times since: "And in fact when I decided to just do it, I said to myself, I said, you know, this Russia thing with Trump and Russia is a made-up story." But Sekulow is trying to draw attention to something Trump said a little while later. "When you review the entire transcript, it is very clear as to what happened," Sekulow said on "Cuomo Prime Time." Sekulow was apparently pointing to this part of the interview, one minute after Trump's "made-up story" comment, when Trump says he knew that firing Comey could prolong the Russia probe. "As far as I'm concerned, I want that thing to be absolutely done properly," Trump said to Holt. "When I did this now, I said I probably maybe will confuse people. Maybe I'll expand that -- you know, I'll lengthen the time because it should be over with. It should -- in my opinion, should've been over with a long time ago because it -- all it is an excuse. But I said to myself, I might even lengthen out the investigation. But I have to do the right thing for the American people. He's the wrong man for that position." After that sentence, there is clearly an edit in the NBC interview. Holt moves on to ask another question. But such edits are not uncommon in television news, especially when an interview subject is rambling. NBC News declined to comment on the Trump team's assertions. Sekulow did not respond to a followup request for comment from CNN on Thursday. On "Cuomo Prime Time," Sekulow was making the case that Trump's later comment -- "I might even lengthen out the investigation" -- is important context. Trump's legal team made a similar argument in a confidential January 2018 memo to Mueller. The New York Times obtained copies of the memo over the summer. "By the way, I'm not faulting anybody to run a clip," Sekulow said on CNN Wednesday night. "But to turn that into literally a federal case, we don't think it's right, we don't think it's constitutional, and we think the entire transcript without question supports the president realized that when he fired James Comey, it might actually extend this investigation, and he said that on the tape." That still doesn't explain why Trump accused NBC of "fudging" the tape.